The Beauty & Health Benefits of an Alkaline Diet | Ionfarms is supply for TYENT Alkaline Water Ionizer and healthy well-being eco loundry washball and Foot patches chipad. The alkaline diet has been earning raves from celebrities such as Kelly Ripa, Kate Hudson, and Elle MacPherson. Ripa actually went so far as to say the diet “changed her life,” helping her heal physical pain. The idea is that by replacing foods that cause excess acidity like meat, dairy, alcohol, sugar, and flour — with more alkaline foods like vegetables, legumes, and nuts — your body will be less susceptible to disease and inflammation. “To achieve health, radiance, energy, and permanent weight loss, it is helpful to understand the underlying causes of diseases and obesity which are acids and inflammation,” explains Ripa’s nutritionist and chiropractor Dr. Daryl Gioffre. If anyone is an ad for an alkaline diet it’s Gioffre. The high-energy, fit, 40-year-old (who looks about a decade younger) credits the lifestyle with helping him shed 42 pounds and a sugar addiction. He tried the eating plan 10 years ago, when despite trying dozens of diets he couldn’t break the cycle of weight gain and sugar cravings. An alkaline diet finally brought change (and a 12-pound weight loss within one week). He now eats alkaline 80% of the time and says it’s transformed his life. “I have more energy than I did in my 20s, I’m running triathlons and ultra-marathons, and I can’t remember the last time I was sick,” he tells Yahoo Beauty. To find out if going alkaline was indeed as transformative as promised, I decided to try Gioffre’s Get Off Your Acid 7-Day Cleanse. Note, that I am typically against fad diets. I don’t even bother trying any because the discipline required to cut out entire food groups seems like way too much work. I truly believe things like cheese and pie are some of the great joys of life. Plus, I have a major sweet tooth. I’ve tried juice cleanses which left me cranky, starving, and the same exact weight when I started. I was skeptical that an alkaline cleanse wouldn’t do anything more than give me major food cravings for a week, but I couldn’t report on it without experiencing it for myself. While a visit with Gioffre is just under $300, his cleanse can be done online for a cost of $97. To begin, he preps his cleanse patients with pages and pages of information, but the gist is this: You have to cut out all dairy, alcohol, meat, coffee, sugar, and gluten. Unfortunately for me peanut butter, one of the staples of my diet, is apparently wildly acidic and inflammatory, so that was out, too. However, Gioffre doesn’t frame the cleanse in terms of what you are cutting out. Instead, he provides an entire meal plan with tons of recipes to choose from that he promises are delicious. He changes his recipes according to the seasons and recommends that clients do a cleanse four times a year. Each morning starts with a smoothie. The first day, I blended coconut water, baby spinach, berries, bananas, and chia seeds. I’ve never put veggies in my morning smoothies before. Ditto on Omega 3 rich chia seeds. To be honest, I usually mix smoothies with orange juice or yogurt (both alkaline no no’s). However, I found that you really don’t notice the vegetables or the chia seeds at all. As the week progressed, I began to look forward to trying out a new smoothie each morning — the recipes were that good. If you follow the plan to the letter and do all the recipes, it requires a lot of shopping, cooking, and prep time. None of the recipes really take longer than 20 minutes to make, but for those who exist on takeout, it will be way more work than you are used to. However, the plan suggests taking the leftovers from dinner dishes like zucchini pasta with spinach lemon pesto or chilled avocado and cucumber soup, for lunch the next day. When I couldn’t cook or cart food to work, I just ordered make-your-own salads including as many of the most alkaline foods as I could (watercress, spinach, kale, cucumber, broccoli, avocado, celery, red bell pepper, and swiss chard). The most surprising thing about the experience, however, is that I wasn’t ever hungry. Normally, I would grab several snacks in an afternoon–a sweetened yogurt here, a few M & M’s there. But I lost my cravings for snacks, and my biggest weakness of all — sugar. 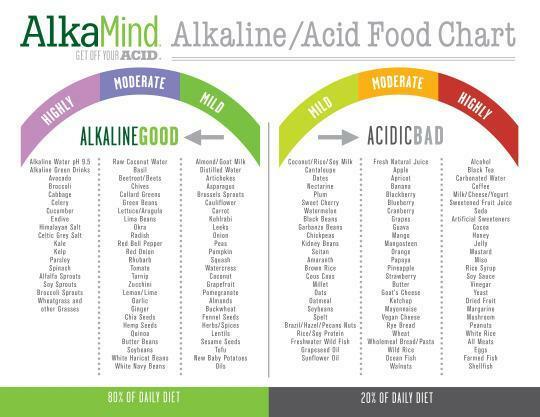 Apparently this is a common result of eating more alkaline foods. “Your body is working more efficiently and does not require as much energy to neutralize the acid because you are less acidic. So your body won’t need to ravish for food,” explains Gioffre. The recipes really are appealing, although I definitely preferred some over others. However, part of the reason the cleanse wasn’t that difficult I am already pretty healthy. I have always loved vegetarian dishes. I think it would be more of a shock for someone who eats a lot of meat and drinks coffee and cocktails everyday. I tried to cheat one day and have a glass of wine, and I felt completely nauseous. For me the big downside was that I woke up most mornings with major headaches. Drinking a ton of water (you’re supposed to drink about half your body weight in water on the cleanse) would help ease the pain, but they were frequent and apparently a symptom of detoxing. The cleanse isn’t all about food. To help encourage detoxing, you are also supposed to dry brush your skin in the morning, take hot baths in Epsom salts and baking soda at night, and do breath work. You also need to take Gioffre’s Alkamind Daily Greens with and Alkamind Daily Minerals powders. The green powder mixed with water takes a little getting used to (it’s pretty unappealing tastewise). Despite going in skeptical, the experience was surprisingly transformative. For starters, my skin —which I always cover up with foundation because of rosacea — looked more even than it has in years with the redness visibly diminished. The other day, I skipped the foundation altogether, something that hasn’t happened maybe ever. I did lose a little bit of weight — just two pounds, although Gioffre promises it will stay off. He says the difference with this and a juice cleanse where you lose water weight is you are losing actual fat. “The best part is that you can continue to lose that weight as long as you keep your diet 80% alkaline.” Unlike a juice cleanse, where I couldn’t wait to get back to real foods, I want to keep eating this way. Since the diet ended four days ago, I’ve added a little protein, but kept up the primarily vegan meals and morning smoothies.